Visit to Amur Gas Processing Plant construction site. 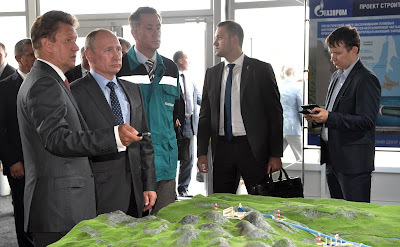 Putin.BLOG Energy Visit to Amur Gas Processing Plant construction site. 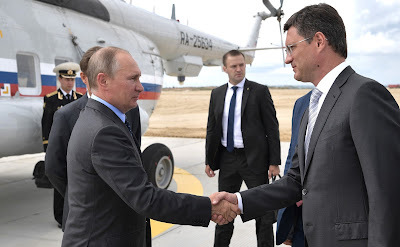 Russian President inspected the Amur Gas Processing Plant construction site and gave the command to start pouring concrete for the foundation. 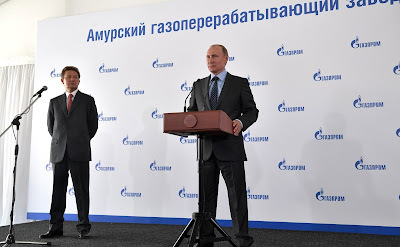 Vladimir Putin visited the construction site of the Amur Gas Processing Plant. The head of state was shown scale models of the Power of Siberia gas pipeline and the Amur Gas Processing Plant. 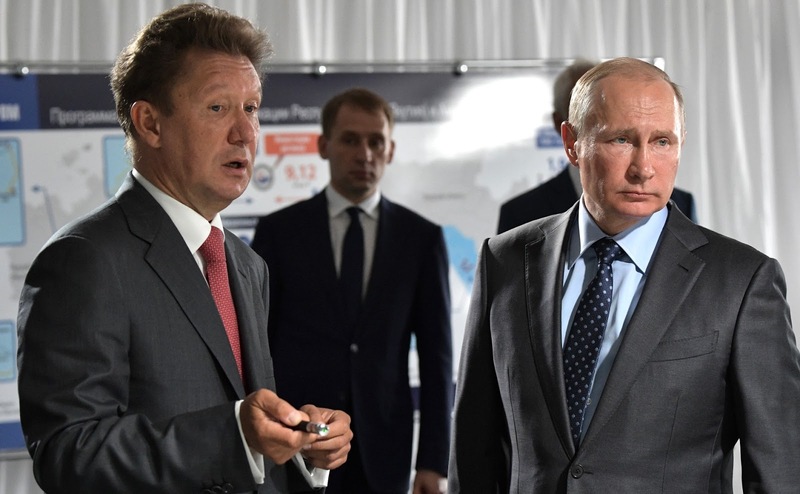 Chairman of Gazprom Management Board, Alexei Miller, told Vladimir Putin about the deadlines and construction stages for the new plant and gas pipeline. The Amur Gas Processing Plant, now under construction 15 kilometers from the town of Svobodny on the banks of the Zeya River, will be the largest Russian gas refinery and a major facility worldwide. It will play an important part in the technological chain of future natural gas deliveries to China via the Power of Siberia pipeline. The project will promote socioeconomic and industrial development in the Amur and other Far Eastern regions. Construction has been progressing since October 2015; site preparation is currently being completed, and road, railway and river infrastructure are also being built. 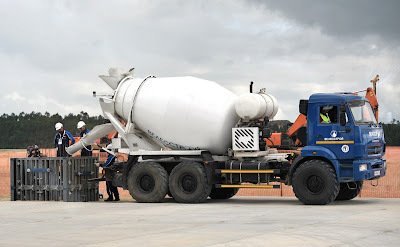 In addition, preparations are underway to build a residential area for about 3,000 employees. Vladimir Putin visiting the construction site of the Amur Gas Processing Plant. While visiting the plant, Vladimir Putin took part in a videoconference and heard reports from Gazprom Dobycha Noyabrsk Director General Igor Krutikov from the Chayandinskoye oil, gas and condensate field in Yakutia that will ship gas to the Amur plant, and by Gazprom Transgaz Tomsk Director General Anatoly Titov, from a section of the Power of Siberia gas pipeline. The preparatory stage of this major effort is over and today we are launching this large project. In the past 50 years, our country has not seen anything similar. Neither the Soviet Union nor Russia have implemented projects of this scale. The only plant of a comparable size was built during the Soviet times in Orenburg. It had a capacity of 38 billion cubic meters of gas per year. This plant’s capacity will be 42 billion, which is a breakthrough not only for the industry but also in the overall development of the Russian Far East. Visiting the construction site of the Amur Gas Processing Plant. With Gazprom Management Board Chairman Alexei Miller. During peak periods, the construction will require several thousand people, or almost 25,000 workers, to be more precise. Once the plant is complete, it will employ 2,500 to 3,000 people, which will allow us not only to move forward in gas production but also to create conditions for building another giant plant in the country and one of the largest in the world. It will be a gas chemical plant employing tens of thousands of people during construction and then a large staff to operate the plant. Thus, we will be equipped to not only perform our export obligations but to expand the gas network in Yakutia and begin supplying gas to Amur Region, where it is almost non-existent. All this is an ambitious project, of which you are all participants. I want to wish you every success. The Amur Gas Processing Plant is an important element of the Eastern gas program. Once opened, it will annually process 42 billion cubic meters of gas and produce 38 billion cubic meters of commercial gas. This plant will become the largest gas processing facility in Russia and the world’s second largest in terms of gas processing volumes. In terms of helium production, this will become the largest helium production plant in the world, the No. 1 plant. It will also produce 2.5 million tons of ethane and 1.7 million tons of liquefied hydrocarbon gases. There are plans to complete the plant stage by stage and to open six production lines, with each line producing seven billion cubic meters of gas. The first stage, or two production lines, will be commissioned in May 2021. The Amur Gas Processing Plant is an integral element of the production chain linking our gas production centers at the Kovyktinskoye deposit in Irkutsk Region and the Chayandinskoye oil, gas and condensate field in Yakutia via the Power of Siberia trunk gas pipeline. Yakutia’s Chayandinskoye oil, gas and condensate field is on the line. Good afternoon, Mr. President and Mr. Miller. 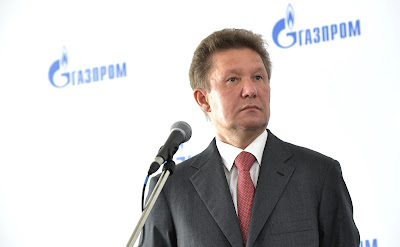 This is Gazprom Dobycha Noyabrsk Director General Igor Krutikov reporting. You can see a modern drilling rig behind me. These rigs are currently used to drill gas wells at the Chayandinskoye oil, gas and condensate field. Today, we are exceeding our drilling targets by over 20,000 meters. We have drilled 73 gas and eight oil wells to date. After attaining design capacity, the Chayandinskoye oil, gas and condensate field is to produce up to 25 billion cubic meters of gas and at least 1.5 million tons of oil annually. Construction site of the Amur Gas Processing Plant. Currently, vigorous efforts to build production facilities are underway, including oil treatment and comprehensive gas treatment units. Today, the Chayandinskoye oil, gas and condensate field employs 5,000 experts and uses over 1,000 pieces of equipment, operating 24 hours a day. I would like to assure you that the current pace of work will help to successfully implement the state Eastern gas program to ensure the timely delivery of products to consumers. 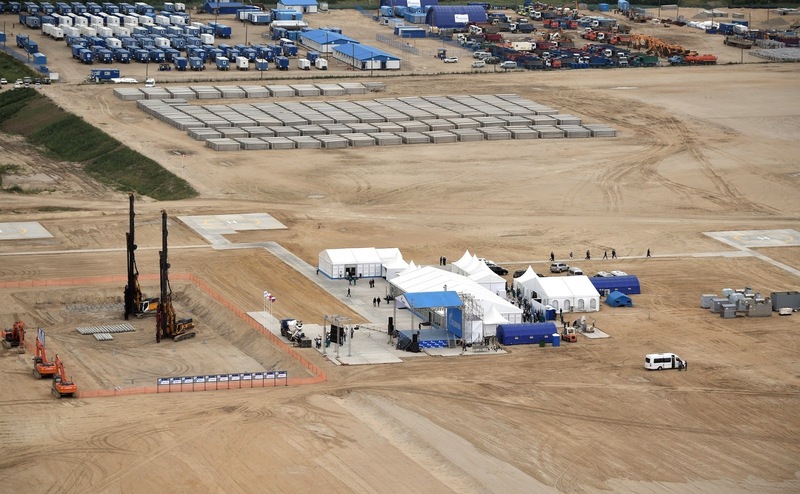 We have a linkup now with a construction section of the Power of Siberia trunk gas pipeline. Good afternoon Mr. President, Mr. Miller. This is General Director of Gazprom Transgaz Tomsk Anatoly Titov reporting. Our company was appointed customer for this construction, and operator of the Power of Siberia trunk gas pipeline once it comes on line. Today, 1,640 km of pipe have been delivered to the pipeline route. This is 80 percent of the total. All of the pipes are made by Russian companies. We have 8,500 people and around 4,000 pieces of equipment working on the construction. Welding has been completed for 1,150 km today, which is 53 percent of the total length. The welding is done using modern automatic welding equipment. All work meets environmental standards. We are up to the task ahead, to supply gas to the Amur Gas Processing Plant and to China in December 2019. The Chayandinskoye and Kovytkinskoye fields, the Amur Gas Processing Plant and Power of Siberia are all integral parts of the Eastern Gas Program, which will create an integrated gas production, transportation, processing and supply system in Eastern Siberia and the Russian Far East. The Power of Siberia trunk gas pipeline, which will be commissioned on December 20, 2019, is the backbone of this system. What is important is that the Amur Gas Processing Plant is playing an important part in developing our international cooperation. Construction subcontractors for the plant include our partners from the People’s Republic of China. The heads of these companies are present at the ceremony today and I would like to welcome them. The Amur Gas Processing Plant, once it comes on line, will give a powerful boost to socioeconomic development in the Far East and Eastern Siberia and will ensure the implementation of the program to connect people to the gas network in these regions. I wish all of the construction workers and company staff success with this project. A large part of the preliminary work for the main facility’s construction has already been completed. Mr. President, I would like to ask you to give the signal to start laying cement for the Amur Gas Processing Plant’s first foundation. The work to lay the Amur Gas Processing Plant’s first foundation has begun. Congratulations! I wish you success and all the very best. Arrival at the construction site of the Amur Gas Processing Plant. With Energy Minister Alexander Novak. 0 Comment to "Visit to Amur Gas Processing Plant construction site."